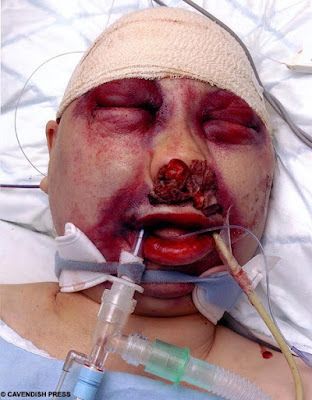 LIVING IN FEAR: SUSAN BEATEN NEAR TO DEATH BY AN EARLY RELEASE CRIMINAL !! SUSAN BEATEN NEAR TO DEATH BY AN EARLY RELEASE CRIMINAL !! IMAGES LIKE THESE ARE HORRIFIC FOR YOU TO WITNESS BUT THINK OF THE INDIVIDUALS THAT GO THROUGH THESE TORTURES BECAUSE 'THE SYSTEM' LETS THESE EVIL PEOPLE FREE ON OUR STREETS ! WE ALL DESERVE TO LIVE IN PEACE AND NOT IN FEAR ! WHY IS IT THAT CRIMINALS GET SO MANY RIGHTS ? WE NEED TO STAND FIRM TOGETHER TO MAKE A CHANGE ! Sweet Jesus, I've never seen anything like this before in my life. My mother was a victim of domestic violence, but it was 'tame' compared to this. No woman, anywhere, for whatever reason, deserves to be treated like this.